Fifty years of continuous bottling under the Simonsig brand might seem a relatively short period, but in the context of the South African wine industry this milestone makes Simonsig one of the oldest estate brands in the country. When that first Simonsig Steen was produced and bottled in 1968, Frans Malan’s winery became the fifth private cellar in the Stellenbosch region to take this step of producer independence. It is interesting to look at the reasons as to why there were so few private wine brands in existence five decades ago – South Africa has been making wine since 1659, but brands bearing the names of estates and families only surfaced in the 1960s. How is it that Australia, for example, has a wine industry 160 years younger than South Africa’s but can lay claim to family farms and brands going back six generations to the 1800s? 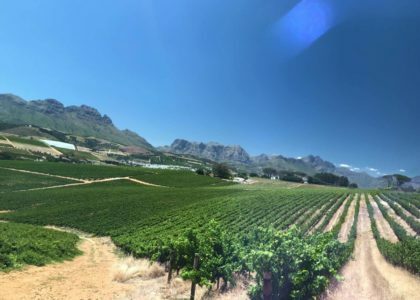 The state of the South African wine industry, and this is what Frans Malan experienced when he began farming on this farm in 1953, was that of one controlled by large corporates such as the KWV, Stellenbosch Farmers Winery and Distillers Corporation. For a wine estate owner there was very little initiative or cause for making wine under you own name. Frans Malan obtained his MSc in Oenology from Stellenbosch University. There he met Liza van Niekerk. She grew up on the De Hoop, what is known as Simonsig today. Shortly after their wedding in 1953, Frans rented De Hoop from his father-in-law, Piet van Niekerk. The farm was planted to Clairette Blanche, Cape Riesling, and Chenin Blanc, with a bit of Cinsaut. Frans, like most private wine farmers of the time, made bulk wine which was sold to Farmers, Distillers and other wholesalers. Known for his independent spirit, Frans dutifully farmed the vineyards of De Hoop, but was itching to do his own thing and unearth new possibilities. When Frans bought De Hoop from his father-in-law in 1963, he not only took over the reins completely, but also found himself at a pivotal time in the South African wine history which was particularly favourable for a wine farmer with vision. The 1960s were of great importance as it was in this decade that South Africa underwent a wine revolution. Suddenly the public’s drinking patterns switched over from spirits (especially brandy) and fortified wines to white table wine. Believe it or not, but beer was not even a force to be reckoned with in those days! And with this increased demand for white wine, there was simply not enough wine around to slake the thirst of the consumer. Initially the private cellars, such as De Hoop, had a limited role to play in this demand for white wine, their task being to supply grapes and bulk wine to the bigger cellars. Here Stellenbosch Farmers Winery was the major player – its Lieberstein label was at that time the largest wine brand in the world of sales of 31m litres in 1964 alone. This is where Frans Malan saw an opportunity: amidst this ocean of cheap white wine, which was being marketed under high volume brands, an opportunity arose for smaller, exclusive quality wines at the higher-end of the market. In other words, the opportunity arose to offer the consumer an alternative choice in wine. These wines were to lay claim to a geographical place of origin and were of single cultivars, far removed from the mass brands comprising blended wines with names such as La Gratitude, Tassenberg, Tassheimer and Grünberger Stein. In 1964 Frans brought about various changes to his wine cellar on De Hoop, leading to a profound improvement in quality. This new cellar was the first private cellar in South Africa to implement cold fermentation for white wine in purpose-built stainless steel tanks set in a cooled cellar. Then came the harvest of 1968, which Simonsig is commemorating in 2018. This was an excellent harvest and with the new cooling equipment in his cellar Frans made his best wine to date. However, when it came to selling the wine in bulk, the trade was not willing to pay the premium prices Frans deemed the wines worthy of. Then and there it was decided that from 1968 a portion of the farm’s wine would be bottled and marketed under an own label. Simonsig’s main income, however, was still from the bulk wine it sold to the large corporates. In 1968 three white wines were bottled: Steen, Clairette Blanche and Cape Riesling. 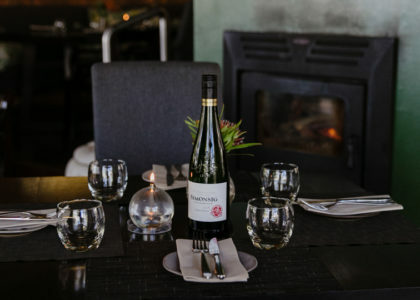 The initial plan was to market these wines under the farm’s name, De Hoop, however this was not possible as the name was owned by Stellenbosch Farmers Winery. Frans also bought the farm Hillbrow in 1964, which was located across from Nooitgedacht on the Koelenhof road. And it was none other than Paul Sauer, owner of Kanonkop at the time, who told Frans at a social gathering, that he did not like the name Hillbrow at all. Simonsig would be a much better name.  So the farm Hillbrow was then renamed to Simonsig, and that also happened to give Frans a suitable brand name for the wine that made it first appearance in 1968. The first bottling was done with a shaky four-head filling machine. It was to cause a lot of headaches over time, but he could count on the advanced machinery of Spätz Sperling from Delheim to complete the bottling in times of crisis. Punch Taljaard, a well-known graphic designer in the Rembrandt Group, designed Simonsig’s first label. The first Simonsig wine was sold for 50 cents per bottle. Marketing was, however, the biggest challenge – actually, with the 1969 harvest on hand most of those 1968 wines had yet not been sold and were still lying in the cellar’s tanks. The large traders decided to make an example of Frans and his competitive endeavours, deciding not to buy any of his bulk wines so as to ward off any competition to their own interests. Wine distribution, promotion and advertising was far different to what we experience today and was also dominated by the large corporate players. This was a substantial hurdle to Frans’s ambitions of selling his wine. This he overcame by the relatively unique idea entailing a marketing campaign over the post. He procured an address list of 40 000 potential buyers. Each of these received a personal letter, printed on luxurious paper, explaining the quality of Simonsig’s wines as well as underscoring the ease with which the wine was available: just send a cheque, and a case was delivered by rail. This mail ordering system and quarterly newsletter were so successful that Simonsig used them for 30 years. Frans was one of the pioneers of one of the South African wine industry’s biggest marketing success stories, namely the establishment of the Stellenbosch Wine Route in 1971 together with Spatz Sperling of Delheim and Niel Joubert of Spier. The idea started with Frans during a visit to the winelands of Europe. In Burgundy and Germany he experienced how a wine region’s wine, image and overall wine culture experience can help to introduce the product to tourists. Thus, a very effective way to get people acquainted with wine and make the wine lifestyle part of their everyday lives – to the benefit of the producer. The first Stellenbosch Wine Route consisted of 17 wine farms, and was a huge success among the wine public right from the start. 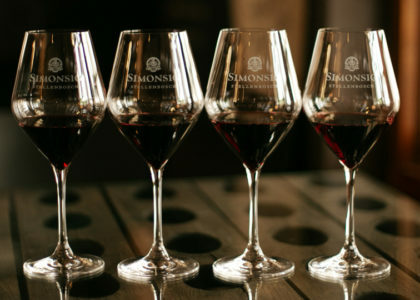 The steep increase in visitor numbers prompted Simonsig and other farms to expand their wine tasting facilities and when you look at where wine tourism stands today, and all the offerings and experiences available at cellars and on farms, one can rightly say that the establishment of the Stellenbosch Wine Route changed the South African wine landscape dramatically. So much so that South Africa is today seen as a world leader in the field of wine tourism. Also in 1971, Frans and other small private cellars went on to establish the Cape Estate Wine Producers’ Association to represent the interests of estate owners and smaller wine producers. It was an important new chapter for the South African wine industry, because like the European winelands for decades before, it now had a body concerned with making wines that emphasized the authenticity and importance of origin, grape cultivar and vintage. The Wine of Origin System of 1973 emanated from this, and together with Cape Estate Wine Producers Association, South African gained a level of integrity they never previously had. Simonsig would not have been able to celebrate 50 years as a wine brand without the generations of farm workers and other staff who have helped us be where we are today. Community development and social upliftment is part of Simonsig’s DNA and one of the farm’s foremost legacies. Here Frans’s role extended to well beyond his farm’s borders. In 1982 he was appointed the first national chairman of the Rural Foundation, a collective effort by the Department of Health and organised agriculture to implement genuine and tangible plans to improve and support the lives of farm workers and rural communities in the fields of health, social welfare and general progress. This year we are grateful for those first steps our parents took to establish this business and we want to praise their commitment and perseverance. Today we are able to celebrate 50 years thanks to their hard work and vision.